This recipe was entered in the contest for Your Best Dumplings and was found on food52. "A delicious Asian dumpling is based on three components: juicy filling, the skin, and the shape of the dumpling. I won't dive into the details of each.... 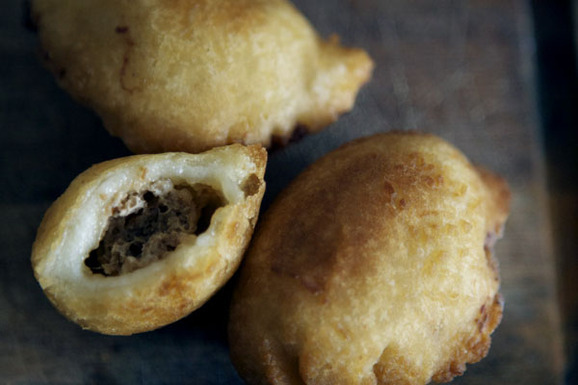 In this recipe, no matter how one struggle with sealing and shaping the dumpling; the result is uniformly puffy and delicious- fried and chewy, light and crispy, sweet and savory, making it a great appetizer." *Also can be pre-made and frozen until use. 1. Mix together all the ingredients for the filling; set aside. 3. Let the dough sit for 1~2 min, or until warm enough to handle by hand; knead the dough until well combined. Roll the dough into a long strip, divide it evenly into 12 sections. 5. Heat oil in pot until 350 degrees; drop 3 dumplings at a time, fry each side about 3 minutes, or until golden and puffy. Drain in paper towel. 6. Enjoy with red rice vinegar dip.